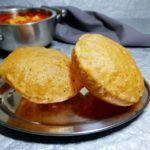 Bathua Poori Recipe is a puffed Indian bread with a healthy and pretty add on ingredient – Bathua. Bathua not only adds nice flavors to the regular poori but also gives it a nice texture. And the hint of green in the pooris is so inviting. 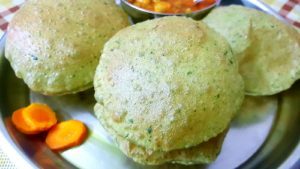 I have kept the simple bathua poori simple but you can enhance its flavor by adding ginger chili paste, red chili powder, garlic paste, garam masala powder, crushed coriander seeds, cumin seeds and so on. Further little rice flour, gram flour (besan), semolina (sooji), grind ed lentils (dal powder) can add to the texture. All my life I have been eating bathua in one or the other form but I never knew that bathua is also known as chenopodium album, lamb’s quarters, melde, goosefoot, fat-hen, white goosefoot, pigweed. 1. Make bathua paste : To make bathua paste, heat some water in a pan. Add bathua leaves along with a pinch of salt and 1/2 tsp sugar. Let it boil for 3-4 minutes or till the bathua softens. Strain out the water and let the bathua cool. Blend it to a coarse paste. 2. Prepare the dough : In a large bowl take 2 cups whole wheat flour. Add the bathua paste, salt to taste, a pinch of asafoetida and 2 tbsp hot oil. Make a semisoft dough using water. Avoid wastage: Rinse the jar with some paste on the walls and use this water to make the dough. 4. Prepare the poori : Divide the dough into 16-20 portions. Roll them. Don’t roll them too thin ot thick. 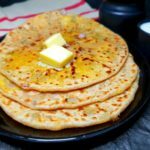 They should be slightly thicker than the chapatis. 5. Fry the poori : Heat sufficient oil in a deep pan / kadai. Check it by adding a small ball. It should surface in 1 or 2 seconds. Add the poori to the hot oil. Using a perforated spoon press the poori. It will puff, flip it. Cook from the other side too. Take out on an absorbent paper. 6. 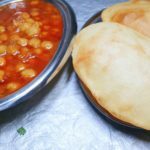 Bon appetit : Serve hot bathua ki poori with any gravies/curries. 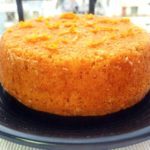 You can also make it for breakfast and enjoy with a cup of tea and some pickle or ketch up. To make bathua paste, heat some water in a pan. Add bathua leaves alongwith a pinch of salt and 1/2 tsp sugar. Let it boil for 3-4 minutes or till the bathua softens. Strain out the water and let the bathua cool. Blend it to a coarse paste. Tip: Adding sugar while boiling the bathua helps to retain its green colour. Tip: Don’t make a fine paste. Make a coarse paste; it will give a better texture to the poori. In a large bowl take 2 cups whole wheat flour. Add the bathua paste, salt to taste, a pinch of asafetida and 2 tbsp hot oil. Make a semisoft dough using water. Avoid wastage: Rinse the jar with some paste on the walls and use this water to make the dough. Let the dough rest for 15-20 minutes. Thereafter again knead it for 2-3 minutes. Divide the dough into 16-20 portions. Roll them. Don’t roll them too thin ot thick. They should be slightly thicker than the chapatis. Heat sufficient oil in a deep pan / kadai. Check it by adding a small ball. It should surface in 1 or 2 seconds. Add the poori to the hot oil. Using a perforated spoon press the poori. It will puff, flip it. Cook from the other side too. Take out on an absorbent paper. Tip: Take care to maintain the temperature of the oil. 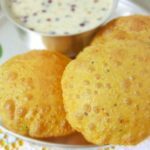 Serve hot bathua ki poori with any gravies/curries. You can also make it for breakfast and enjoy with a cup of tea and some pickle or ketch up.